Introducing a setting more than 30 years in the making. Avremier is a world said to rest at the very center of Creation. Contested by gods and monsters of outer dimensions, this is the new home of a colonial human race. Established less than 500 years past, human civilization has yet to match the heights of the older races, but humanity does lead the way in the industry of adventuring. Whether you further the cause as a human adventurer, or make your mark as a dwarf, elf, halfling, or hobgoblin PC - Avremier is a setting for glory and renown. A new fighting PC class - the Armiger. Champions of Humanity. Setting-specific details for running non-human PC races, including a hobgoblin player character race: the Yalkhoi. The industry of the professional adventurer, including guidelines for gaining Renown as a hero of the realm. 24 new Magic-User spells. 10 new Cleric spells. 6 new Druid spells. Over 50 new and variant monsters, such as the Dungeon Dragon, Flutterpotamus, and Cauldron Golem. More than 100 new magical weapons and items. Wield the bizarre chess-aspected Checkered Blade or baffle opponents with the mighty Wand of Dragon Bubbles. The known, surviving deminities - diminished remnants of Humanity's old gods. Details of the Avremier setting and environment. This homage to the first published fantasy RPG rules is the first of a five-volume set. 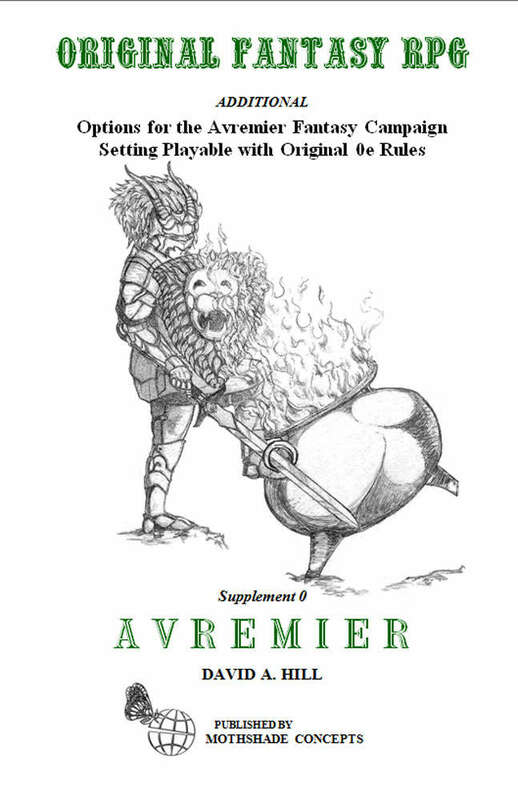 This, the Avremier booklet and the other Avremier books are extremely well written. Although slightly different in setting/rules from the Oed and later TSR offerings (D&D/AD&D), they do pay great homage to the original game in scope and typeset/format, and do translate well in order to incorporate in ones own setting, or to play them as Avremier campaigns. The artwork is original and very well done, the sense of humor is, well, very close to mine and I personally find it awesome. I have read and seen other OSR type offerings of the current and past crop of efforts, and this is by far the best I have run across in quality and quantity of content. Avremier, in the makings from decades ago, now available to us all. I will always look for new releases as they are of the highest calibre. Dave of Eclectic Hobbies. Hello, will PoD versions be coming out? The plan is to get the first three supplements up for download, then set up the PoD versions. We're working as fast as we can. Hopefully, it won't be too much longer. You're welcome. Thank you for your interest in Avremier. This title was added to our catalog on May 08, 2018.